After cash demonetization that happened in India in November 2016, everyone is shocked. If such a thing like demonetizing 85% of currency notes that were circulating in India, anything could happen. Indian Prime Minister Narendra Modi is determined to fight against black money. After demonetization Narendra Modi said that this plan was in his mind for past few months. Prime Minister Modi also mentioned that he has more tough plans in his mind and will implant it in future if needed. It means that any kind of strict actions will be taken against black money. Will it be a Gold or Real estate surgical strike ? 24-11-2016 – News reports are coming out that strict regulations will be made regarding property, land registrations done by all people who have income above Rs.2,50,000 per year. Income tax department has asked to quote PAN number for all land registrations done by people who have income more than 2 lakhs fifty thousand. Earlier quoting of PAN number ws only for people who had income of more than Rs.2,50,000. This means majority of people who do buying or selling property have to give their PAN number. 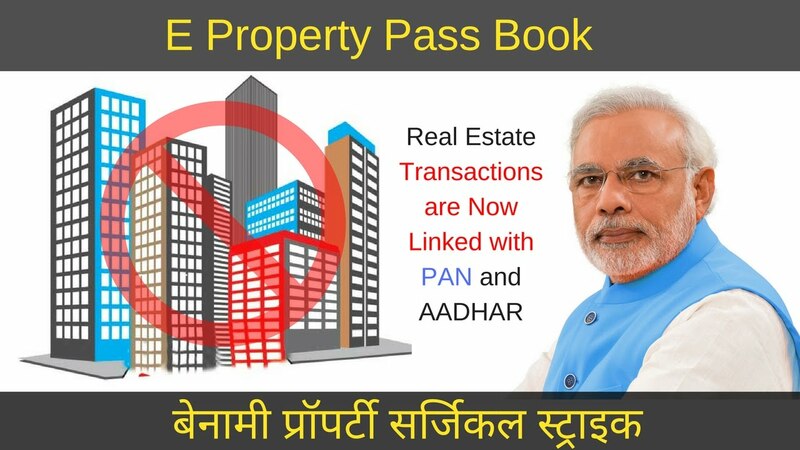 So even though E-Property pass book is not implemented in India as speculated, there will be strict regulations on land, property registrations. More strict restrictions are believed to come which will affect real estate making value of properties go down. This will be a big blow to people who purchased properties for huge rates with black money, planning to sell it later. So let us wait and see what are upcoming notifications regarding real estate black money unearthing. What are different forms in which black money is stored in India. It was assumed that black money is transferred or deposited into Swiss bank accounts abroad. On investigations it was found that it was true to some extent. A contract agreement was signed between India and Switzerland known as Multilateral Competent Authority Agreement (MCAA). From 2019 Switzerland will start giving details of Indians who have invested money in Swiss bank accounts. Another shocking fact that lakhs of crores of money that is made illegally is invested in real estate properties, gold investments, fixed deposits in co-operative banks, real physical cash hidden in buildings .etc. With demonetization all hidden real cash is unearthed or made useless with only value of paper after removing it’s legal tender from 8-11-2016. Co-operative banks had crores of deposit in it and did not follow KYC norms as per guidelines of Reserve Bank of Inida (RBI). This was why RBI did not allow exchange of old notes by Co-operative banks and so customers are not able to liquidate cash in these banks. Income tax department will conduct investigation to reveal sources of all deposits in Co-operative banks. Savings accounts, Current accounts that make deposits above allowed limit will be given noticed by IT department to reveal source. So what remains now is gold and real estate where black money is hidden. Black money holders who deposited in both these things are having sleepless nights. They are having nightmares that Narendra Modi will impose some kind of ban on both these investments in future. This was when a message became circulated among gold traders association that gold import ban may happen in India. It caused lot of tensions to jewelry owners and customers regarding what will be actions taken against gold. Later gold merchants said that it is just a possibility and not a confirmed decision. Black money is said to affect economic development of India, where lakhs of people do not even have food for one time. Is eradication of poverty be possible by hunting down black money in India. After demonetization of currency and bringing limits to withdrawal limits everyone in India became poor and experienced what is poverty for 1 or 2 days in his life. Many experts said that gold import ban may not be possible, but there are many people saying that it could be possible as a way to stop black money conversion into gold. In a situation like currency demonetization of Rs.500, Rs.1000 notes in India everyone is prepared to accept that Modi is a strong leader who can take tough decisions.